Bargarh is one of those small towns that dot the Indian landscape, located in Western Odisha, close to the border with Chattisgarh. The Eastern Ghats flank the town, and they are quite rich in their flora and fauna. Historically speaking, the place was originally called Baghar Kota, and for some time, it was the capital of the Chauhan rulers of Sambalpur. Till 1992 the place was part of Sambalpur district, until the then Chief Minister, the late Biju Patnaik, created a new district Bargarh, out of Sambalpur, with the town as the district HQ. While Odiya is the official language for communication, most of it’s inhabitants speak in Sambalpuri. Primarily dependent on agriculture, the town is a commercial hub for textiles, especially the famous Sambalpuri sarees, that are produced and sold here. The town’s major claim to fame though is something called Dhanu Jatra, that happens every year here. Dhanu Jatra is basically to celebrate the story of Krishna and his slaying of Kansa, and is so called as it is held during the month of Dhanu. It is celebrated for a period of 11 days, narrating the tale of Krishna and Kans, through use of dance and drama. What makes this unique however is the way this play is actually staged. While it does sound similiar to Ram Leela, here, instead of one single stage, the entire town of Bargarh becomes an open air theater itself. 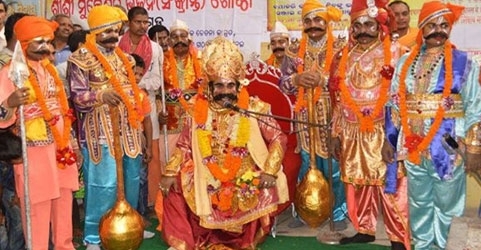 The uniqueness of Dhanu Jatra is that the town of Bargarh and the neighbouring village of Ambupali, become the setting for the entire drama about Krishna and Kansa. Every nook and corner of these two places becomes a setting for the drama, with all the residents joining in and even those visiting it. In a way this is an interactive drama, where the audiences and the actors become one. Imagine 10,000 residents taking part in this entire skit, on their own, and none of them are professional actors per se. The record though is held by Gopal Sahu, a cop, who played the role of Kans for a record 22 years. And there is no rivalry between the actors here, many do it for sheer love and passion. Kans here is seen in two stages, during the morning, he is like any other king going around, meeting his subjects, imposing small punishments and fines, listening to their problems. During this time, every part of Bargarh becomes an impromptu stage of sorts, with the residents, getting drawn into the action. During night time, however Kans retreats to his Rang Mahal, where he spends time with his ministers, plotting on ways to kill Krishna, and invoking the demons. The Rang Mahal is a huge stage that is set up right in the middle of Bargarh town, decorated to look like a palace. And Ambupali enacts the scenes of Krishna’s life, his growing up under Nanda and Yashoda, his exploits with the demons. The Jeera river becomes the Yamuna, where Krishna performs his Ras Leela dance, while a pond becomes the Kalindi where the epic battle of Krishna with the snake Kaliya is enacted. Also the actors in the skit, deliver their dialogues impromptu sans any script or prompting. For the entire period, the town of Bargarh, is transported into another era, it is like entering a time machine. You could see Krishna doing one of his playful antics, or Kansa could be walking just past you. You are not the audience watching a play here, you are part of the play here, in some way or other. And finally the Dhanu Jatra comes to an end, with the last day showing Krishna and Balaram, entering Bargarh( Mathura), with the help of Akrura. The actor who plays Akrura, takes Krishna and Balaram across the town, and people there treat them like real gods. Krishna and Balaram’s fight with the wrestlers Chanura and Mushtika is enacted live, and finally the festival comes to an end with Krishna killing Kans, and restoring the throne to Ugrasen, Kansa’s father. He also frees his real parents Devaki and Vasudev, from the prison, which is another building in the town. The origins of Dhanu Jatra are not very clear, many state that this started after independence, when people celebrated freedom from British rule, with Kansa and his ministers representing the colonial rulers. In effect it is more of a harvest time festival with farmers and working classes, doing a thanksgiving of sorts. Whatever be the story behind it, fact is Dhanu Jatra is unique in it’s own way, a festival, where a town becomes an open air theater, and the audiences themselves become part of the drama. Truly, Incredible India. This entry was posted in Hindu festivals, Hinduism, Uncategorized. Bookmark the permalink.